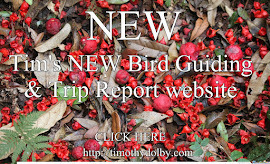 The following report describes a birding trip to the fabulous Mount Isa region in north-west Queensland (May 2012), an area completely under-estimated as a birding destination. 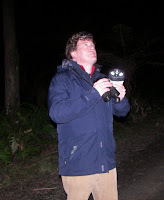 With me on the trip were two birding friends, Greg Oakley and Tim Bawden. The region is often described as the country of "Dinosaurs, Fossils and Mining", by my reckoning you could add one more to that list, "Birds". We spent seven days in the region, flying in from Melbourne Sat May 12th, and then flying out May 19th. Our basic itinerary involved touring around Mount Isa for a few of days, visiting sites for Carpentarian and Kalkadoon Grasswren and also birding around Lake Moondarra. We then travelled 500 km south to Bladensburg National Park, incorporating a side trip to Lark Quarry Conservation Park. 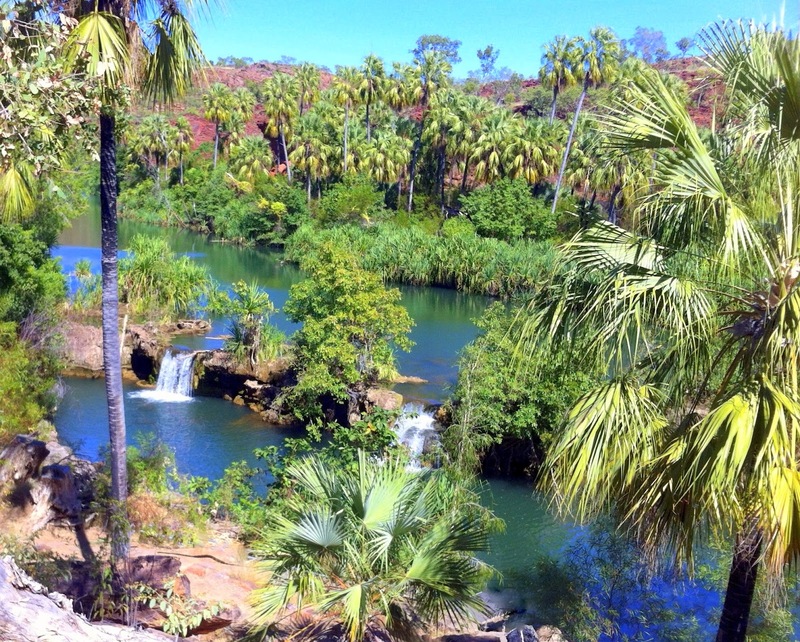 From there we drove 700 km north to spectacular Boodjamulla (Lawn Hill) National Park, via Cloncurry and Chinaman Creek Dam. 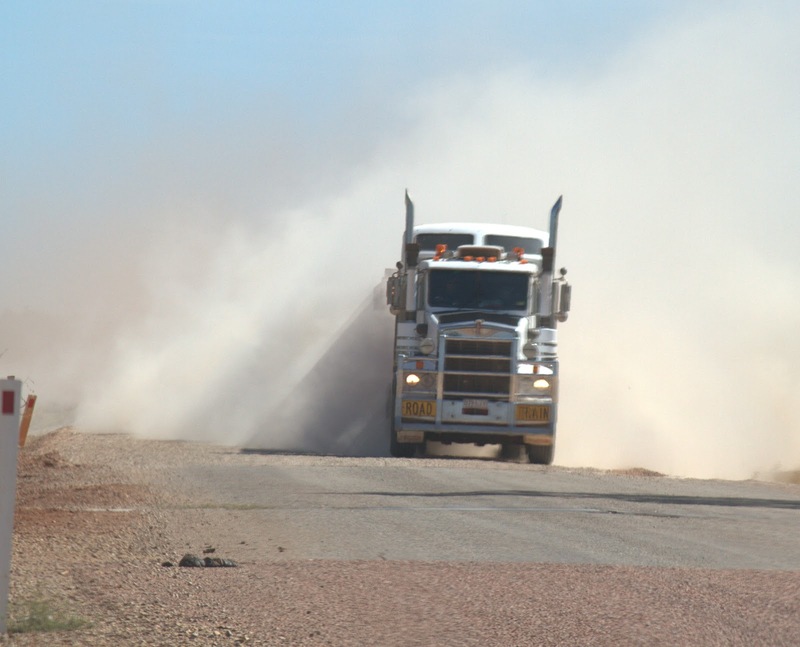 By the time we flew out of Mount Isa we'd driven 2500 dusty kilometres. 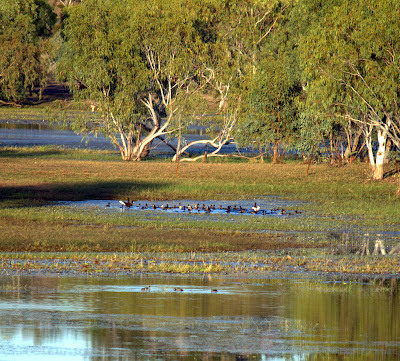 These areas can be described as some of the most arid regions in the world, for example Cloncurry originally held the Australian record for the highest known temperature in the shade, at 53.1 °C (January 1989); however, after recent rains the landscape was transformed, with an abundant of birds and wildlife. It was in fact the perfect time of year to visit: post-Wet season with daytime temperatures 30°C and at night 15°C. It was a dry, welcoming heat, and there wasn't a cloud in the sky. Bird numbers were high, many had breed up during the months preceding, and many – such as the finches – were breeding a second time (in the Austral monsoon tropic land birds have been shown to have a dual breeding periods). 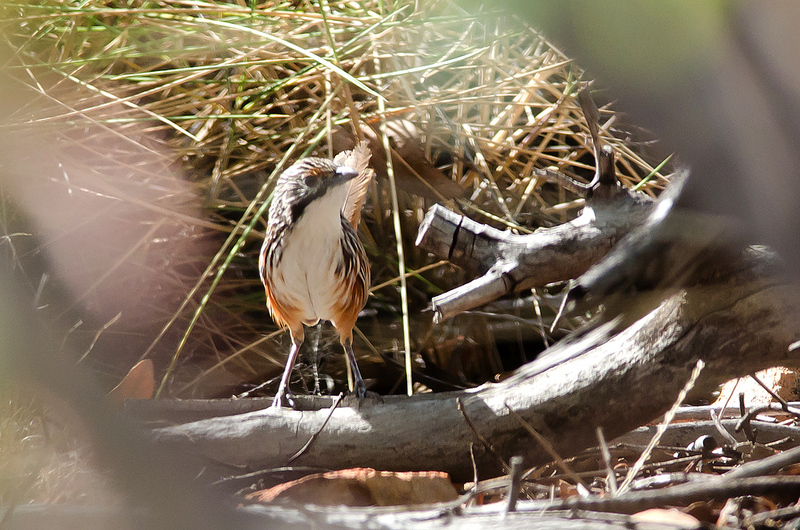 I was particularly targeting two species near Mount Isa: Kalkadoon Grasswren, localised, recently split from Dusky Grasswren, and appropriately named after the local Aboriginal people (Mount Isa refers to itself as "Kalkadoon Country"); and the rare Carpentarian Grasswren, considered one of Australia's hardest to see birds. On a personal level, getting both these species would take my Grasswren tally to nine, leaving only the Kimberly-restricted Black Grasswren and the recently split (from Thick-billed) Western Grasswren. Near Mount Isa there are several good sites for Kalkadoon Grasswren. 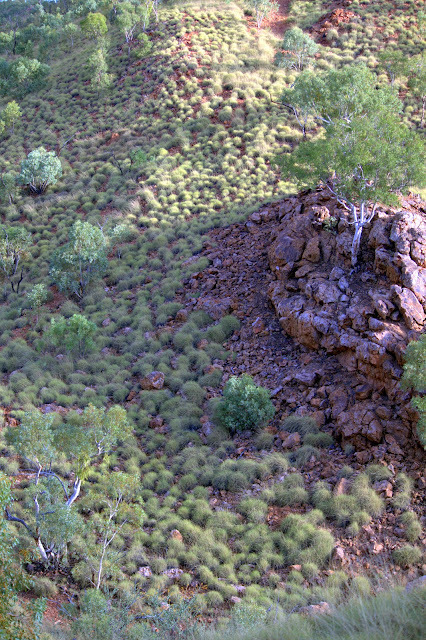 The closest is a Spinifex covered valley at the end of Pamela Street, just 2 km from the centre of town. 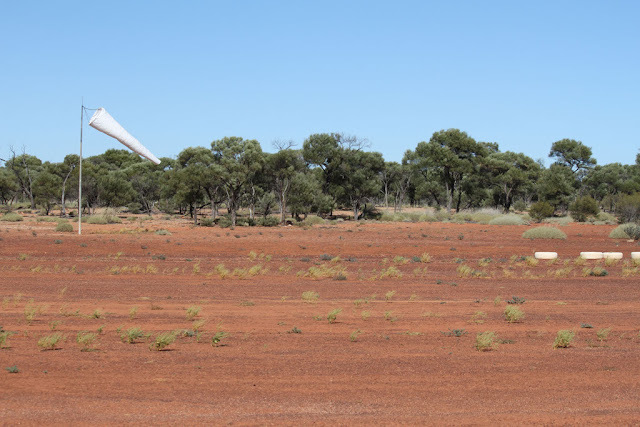 We parked at the gate at end of the road, walked up the trail 100 m to where a smaller walking trail branches south down a small Spinifex-lined valley - it's located between two large water tanks (-20.73243,139.511716). Almost immediately we heard a Kalkadoon Grasswren calling, although we didn't get views until we reached the south end of the walking trail, about 100 m from the turn-off. Spinifexbird was common here, and there was also a large family of Spotted Bowerbird. Perhaps the best-known site for Kalkadoon Grasswren is Mica Creek, 13 km south of Mt Isa on the Diamantina Developmental Rd. We parked 100 m before the Mica Creek causeway, and walked 150 m west, crossing a small gully to an area containing a wrecked car (-20.821111,139.45916). (If worth noting that there's another car wreck immediately next to the road.) We search here, and up a gully that headed north. Grasswren-wise we had no success here (by this stage it was hot and the middle of the day), although we did manage to see some nice birds: Red-backed Kingfisher, Black-tailed Treecreeper, Variegated Fairy-wren, Grey-headed, Grey-fronted and Black-chinned (golden-backed ssp laetior) Honeyeater. 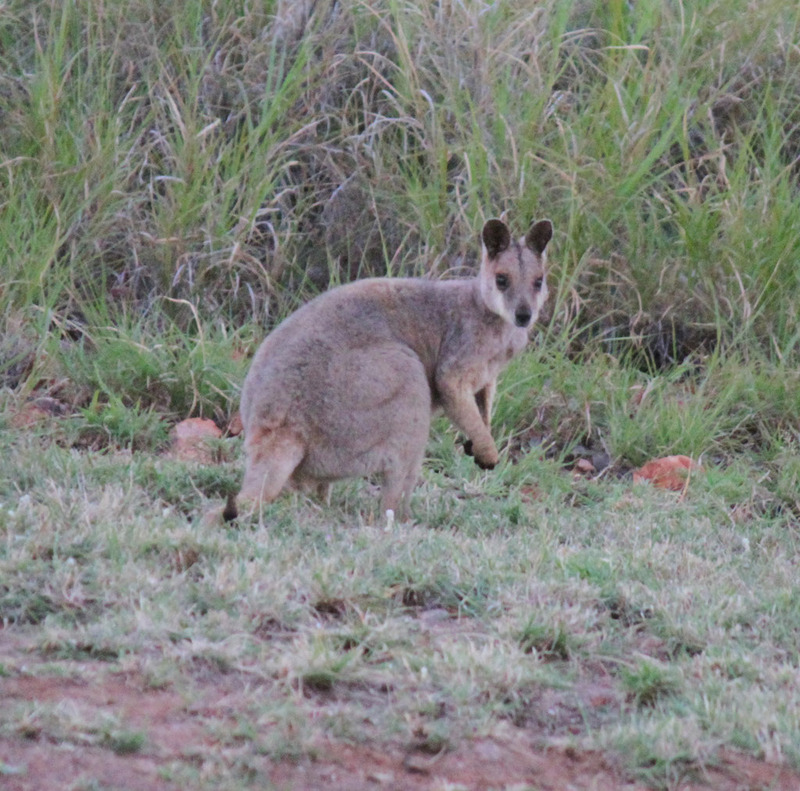 We also bumped into an attractive Purple-necked Rock-Wallaby. 6.6 km from Barkly Hwy: we stopped at a breakaway on the right side of the road and then walked through an area scattered with termite mounds until we reached a Spinifex-dominated landscape 400 m east of the road - near where white quartzite protrudes through the Spinifex. After a bit of searching (mainly listening) we found a family of four Carpentarian Grasswren, providing fantastic views. Everyone commented how the field guides don't do the bird aesthetic justice, particularly in terms of the rich-rufous coloration. It may be the most attractive of all the grasswren. The birds ran and hoped between clumps of Spinifex and, like other Grasswren I've seen, they seemed to have a preference for hanging around tree clusters that acted like small islands in a sea of Spinifex. 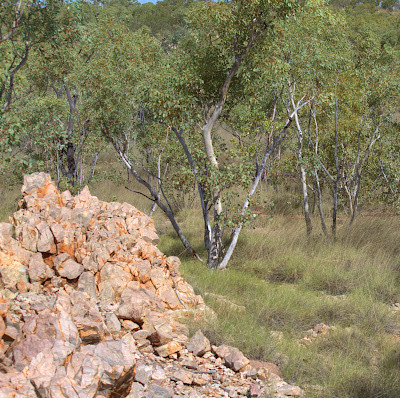 8 km from Barkly Hwy: this the probably the best-known of the Carpentarian Grasswren sites along McNamara's Rd (marked as Gunpowder Rd on Google maps), and is marked with a small cairn on the right side of the road (indicating a track that leads right). We looked in the larger patches of Spinifex, particularly along a well-vegetated gully and creek line 150 m east of the road. Here flushed a single Carpentarian Grasswren – giving a short flight across the creekline, and then running grasswren / road-runner-like up the creek line, kicking up dust before in ran into a large clump of Spinifex.
. 11 km from Barkly Hwy: we looked 11 km from Barkly Hwy, along the dry creek bed 400 m west of the road. Although we didn't see any birds, the habitat looked perfect.
. 3.8 km from Barkly Hwy: although we didn't search here, this is another reliable site for Carpentarian Grasswren (stopping near a left-side pullover just before a small creek line, and searching 400 m east where the Spinifex has open pebbly-ground in between). Other birds we saw along McNamara's Rd included Brown Quail, Little Button-Quail (plus another rustier-coloured button-quail, possibly Red-chested), Australian (Cloncurry ssp macgillivrayi) Ringneck, fast-flying flocks of Budgerigar, Red-winged Parrot, Spinifexbird, Black-tailed Treecreeper, Crested Bellbird, Hooded Robin (ssp picata), Red-browed and Striated Pardalote, Variegated Fairy-wren and honeyeaters such as Grey-headed and Grey-fronted. We also flushed a Tawny Frogmouth - it looked remarkable flying through the Spinifex-covered landscape during the heat of the day. 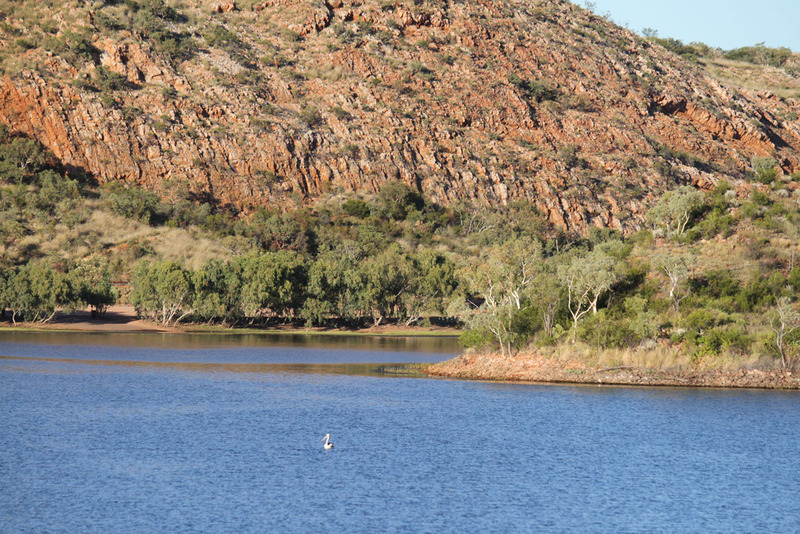 An impressive artificial lake on the Leichhardt River, Lake Moondarra is 20 km north of Mount Isa. When visiting here the main attraction is the wide selection of water and shorebirds, however there's a great collection of land species surrounding the lake. 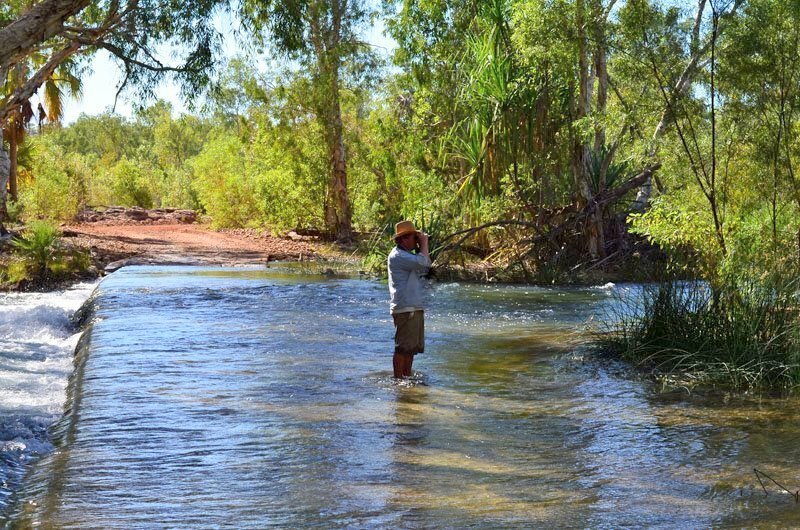 Access is from the Barkly Hwy, 5 km north of Mount Isa, with the lake a further 15 km. On the drive into the lake we stopped at the impressive Clearwater Lagoon (on Lake Moondarra Rd, 10 km from the Barkly Hwy). The lagoon was covered in waterbirds, particularly 'tropical waterbirds', such as Wandering and Plumed Whistling-Duck, Green Pygmy-Goose, Comb-crested Jacana, Glossy Ibis - perfect wetland species for visiting Victorians! There were also good numbers of Hardhead, Great Crested Grebe, Australasian Darter and Intermediate and Great Egret. Clearwater Lagoon is a known drinking site for finches. There wasn't much drinking activity at the lagoon, however we had better luck at an small ephemeral waterhole 100 metres further along the road. Here there were large numbers of Long-tailed, Zebra and Double-barred Finch, Mistletoebird and Diamond, Peaceful and Bar-shouldered Dove. Along the track to the Mt Isa Water Ski Club, it heads west just before you reach the first picnic area, 14 km from the Barkly Hwy, we found a flock of 10+ Painted Finch. They were feeding along the road near the base of a series of small cliffs towards the end of track. Several Purple-necked Rock-Wallaby were also seen here - giving us the classic Rock-Wallaby views, their head peering over the top of rock walls. Warrina Park is situated at the end of Leichhardt River Rd below the Lake Moondarra dam wall. Here there were at least 20 feral Indian Peafowl (we'd previously seen a single male Peafowl on the banks of the Leichhardt River near the Lake Moondarra Caravan Park), easily the largest 'wild population' of Peafowl I've seen in Australia. 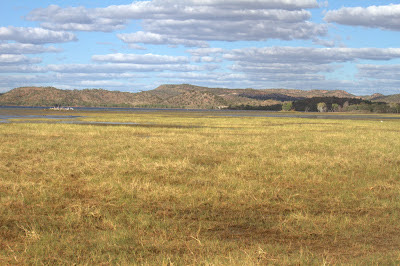 Grassy bays on the western side of Lake Moondarra. 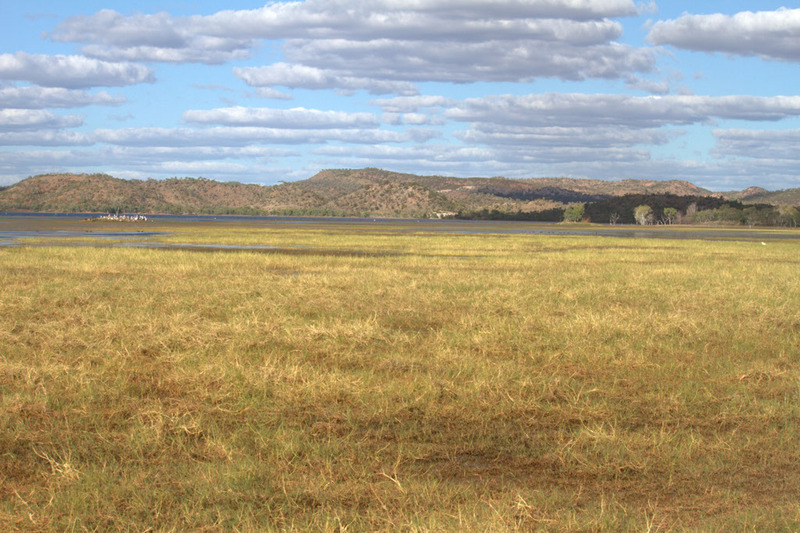 We also visit the wide grassy bays on the western side of the Lake Moondarra. 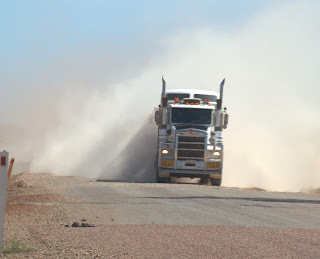 To get there drive down a dirt track that leads east from the Barkly Hwy, 16.5 km from the Leichhardt River Bridge in Mount Isa – continue east along the track for 4.4 km. We were hoping to see Yellow Chat, they occasionally feed along the shoreline, however upon arriving there was no less than 8 Australian Hobby hunting over the grassy flats, mainly feeding on large red dragonflies. If there'd been any Yellow Chat about, the falcon would have scared (or eaten) them off. We find large numbers of waterbirds: White-bellied Sea-Eagle, Wandering and Plumed Whistling Duck, Green Pygmy-goose and Glossy Ibis, Australian Darter, Great Crested Grebe, Great, Little, Intermediate Egret, White-necked Heron, and Caspian, Gull-billed and Whiskered Tern. I'd love to visit this area later in the year, when the migratory shorebirds are about: Long-toed Stint, Red-necked Phalarope, Oriental Pratincole, Australian Painted Snipe, Little Curlew, Common, Wood and Marsh Sandpiper, Pacific Golden and Oriental Plover, Yellow Chat and Eastern Yellow Wagtail have all been recorded here. Not a bad list. From Lake Moondarra we headed south to Bladensburg National Park, stopping at Chinaman Creek Dam (located off the Barkly Hwy immediately west of Cloncurry). Like Moondarra, it's an artificial lake and on a smaller scale almost as impressive. Birds here included Nankeen Night Heron, White-necked Heron, Black-winged Stilt, Rainbow Bee-eater and Whiskered Tern, and the dam is meant to be good for Black Bittern, Spinifex Pigeon and Pictorella Mannikin. There were large numbers of Black Kite (a hundred million to be precise) by this stage of the trip, due to their commonality, I was refusing to call or even name Black Kite - instead I'd refer to them as 'The birds that shall not be named.' Frustratingly, due to the twitching nature of birding, you're forced to look at each individual kite – even if just for an instance – eliminating them from the possibility of being another raptor. The other highlight at Chinaman Creek Dam was a Purple-necked Rock-Wallaby feeding around the picnic ground. From Chinaman Creek Dam we headed down to Bladensburg National Park. It's a large, very pleasant and remote park with areas of sandstone ranges, grassland plains and river flats - it reminded me of Wyperfeld National Park in Victoria. To get there we drove south from Winton taking the Winton-Jundah Rd, and after 7 km turned left onto the ‘Route of the River Gum’. From there it's 5 km to a junction - we turned right following the ‘Route of the River Gum’. Here we stayed at the amiable camping ground at Bough Shed Hole, 12 km from the junction. Conventional vehicles can access Bladensburg, and we found it easy going in the X-Trail. Bladensburg's an interesting park for a number of reasons: it's the eastern boundary range of Spinifex (Triodia pungens) and as a result has one of the most north-easterly populations for birds such as Spinifexbird, Spinifex Pigeon, Striated Grasswren, Rufous-crowned Emu-wren and Painted Finch. Interestingly we weren't here for any of these species, rather we'd come to see Hall's Babbler and Chestnut-breasted Quail-thrush (recently split from Western Quail-thrush - formerly race marginatum of Chestnut-breasted Quail-thrush), with Bladensburg representing the most northerly extension for these two species. Much of the northern half of the park consists of reddish clay soils covered with Mitchell grasses and open woodlands. Along here we saw Emu, Australian Bustard, large flocks of Cockatiel, a small group of Ground Cuckoo-shrike and Black-faced and Masked Woodswallow. As you continue through the park the landscape becomes more vegetated, intermixed with areas of Spinifex and Eremophila. Black Honeyeater were common, and we saw good numbers of Grey-headed and Spiny-cheeked Honeyeater, Crimson Chat and flushed a few Little Button-quail. Bladensburg fence line - one of Australia's most easterly sites for Rufous-crowned Emu-wren and Spinifexbird. 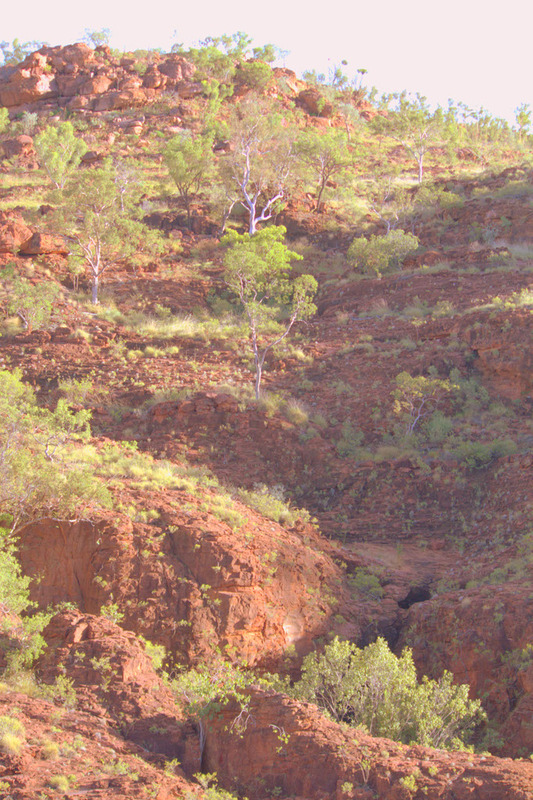 Skull Hole is a rocky water-filled gorge about 20 metres deep. The birding was quiet around the hole, possibly because there was plenty of ephemeral water around the park. 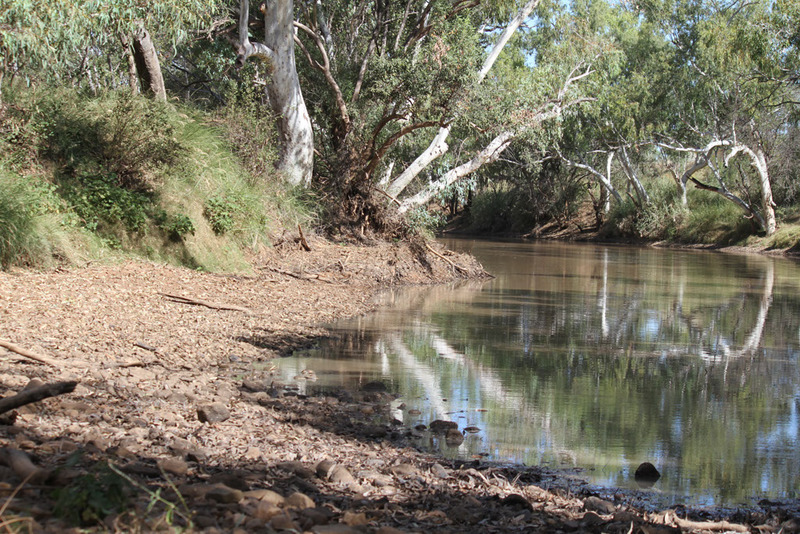 Normally it's considered a potential site for birds such as Spinifex Pigeon and Painted Finch, while Hall’s Babbler occur along the creek line and Gidgee woodlands 2 km north of Skull Hole. Just prior to the Skull Hole car park a dirt track leads south. After 2.5 km we came to a dry creek bed (to cross it would require 4WD). We searched east along the creek for Hall's Babbler, with several families said to occur in this area. We dipped on the Babbler, but did find an active pair of Chestnut-breasted Quail-thrush about 300 m east the road. 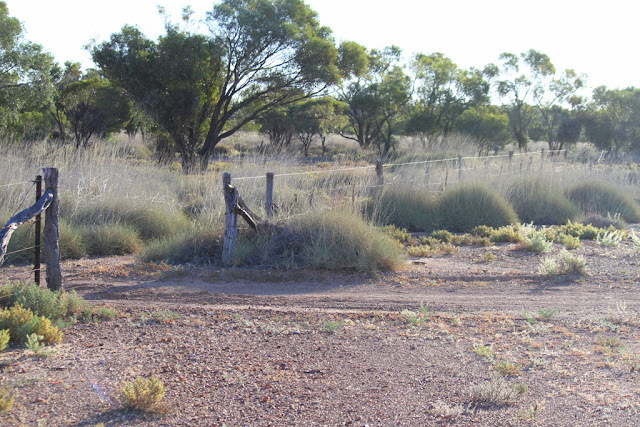 If you continue a further 300 m along the road you come to a old fence line and open gate; walking right along the fence line there's a superb area of Spinifex (between the road and an area of escarpment). This is a good site for Rufous-crowned Emu-wren, Spinifexbird and Spinifex Pigeon, while other birds here included Hooded Robin, Red-browed Pardalote, Inland Thornbill (ssp cinerascens - the northern extent of this richer-coloured race), Little Woodswallow, Rainbow Bee-eater, Restless Flycatcher and Crested Bellbird. The birdwatching around the Bough Shed Hole camping area is excellent. 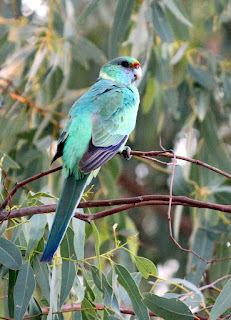 A wide range of species come in to drink, particularly near the northern section of the campground, such as Australian (Cloncurry) Ringneck, Red-winged Parrot, Red-backed Kingfisher, Black Honeyeater, Crimson Finch, Inland Thornbill, Striated and Red-browed Pardalote and Double-barred and Zebra Finch. Tim Faulkner, Scott Ryan and John Weigel had seen several Chestnut-breasted Quail-thrush here the day before - feeding around the scree covered ground immediately north-east of the north section of the campground. Lark Quarry Airfield: good for Hall's Babbler, Rufous-crowed Emu-wren & Striated Grasswren. From Bladensburg we made a brief trip to Lark Quarry Conservation Park, 110 km south-west of Winton. 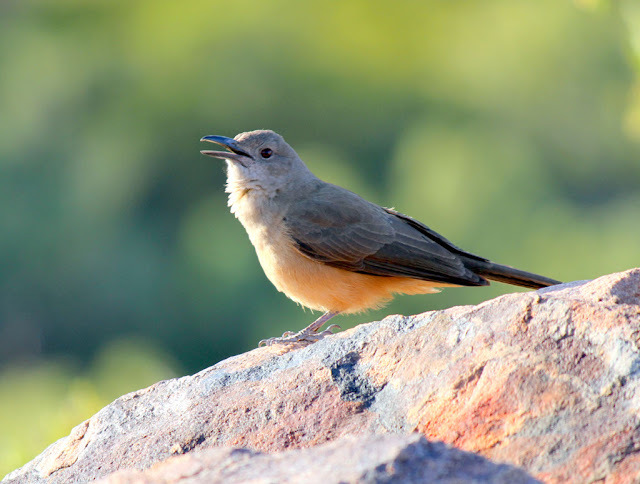 We found Hall's Babbler in the Mulga adjacent to the airfield (the airfield is located half way along the road to the Lark Quarry dinosaur trackways). They were feeding on the south side of the airport, in the area directly behind the airfield’s wind sock. The Spinifex on the north side of the airfield is also a site for Rufous-crowned Emu-wren, Striated Grasswren (ssp rowleyi) and Spinifexbird, where we had brief encounters of each, and we also saw Varied Sittella (white-winged ssp leucoptera), Grey-headed and Grey-fronted Honeyeater, Hooded Robin, Jacky Winter (browner ssp pallida) and Crested Bellbird (ssp pallescens). It is also worth checking the microwave tower located at the beginning of the road to Lark Quarry - this is an occasional roost site for Grey Falcon. Nirvana - Indarri Falls (Lawn Hill Creek). On the drive in we stopped at Archie Creek (located 49 km from Wills Development Rd turn-off, 37 km north-east of the campground at Lawn Hill). Large numbers of finches were drinking along the creek, so we grabbed our 10$ director chairs and sat down to see what birds came in. In the next hour we'd recorded Pictorella Mannikin, Long-tailed, Crimson (black-bellied ssp phaeton), Double-barred and Zebra Finch, a bevy of Brown Quail, Diamond and Peaceful Dove, Black-chinned and White-throated Honeyeater, Pheasant Coucal, Black-necked Stork, Blue-winged Kookaburra and Azure and Sacred Kingfisher (at one point I nearly had all three kingfishers in a single binocular focus). On the drive into the park we also came across a two-metre long Black-headed Python, a snake that feeds almost exclusively on other snakes. At the Lawn Hill campground the first bird we saw when we got out of the car was Buff-sided Robin! I'd travelled 3000 km to see this bird, was expecting a decent birding challenge, only to see it in the carpark! A spectacular looking Robin, far more approachable than their recently split cousin (White-browed Robin), they were a common bird in the riverine vegetation. Also around the campsite were Northern Rosella, Varied and Rainbow (red-collared ssp rubritorquis) Lorikeet, Red-winged Parrot, Great Bowerbird, Silver-crowned Friarbird and Channel-billed Cuckoo. 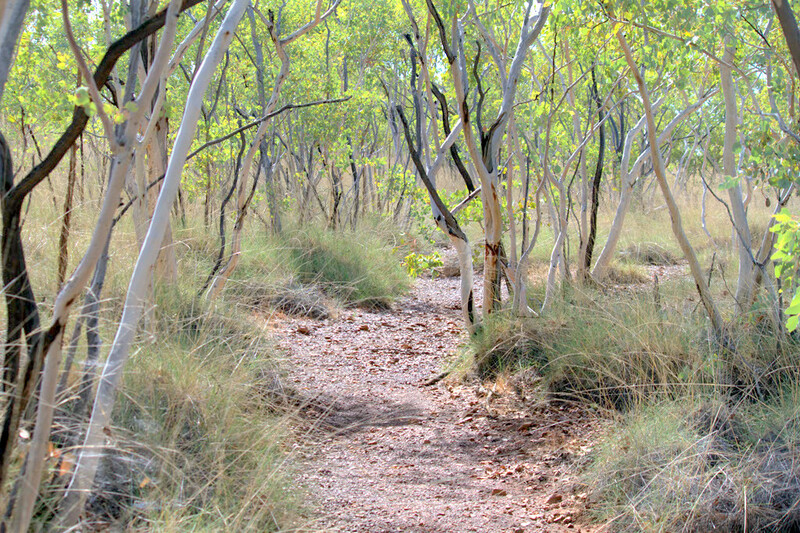 Lawn Hill Creek - habitat for Purple-crowned Fairy-wren. We concentrated most of our birding along the deep blood-red gorge between the Indarri Falls and the Upper Gorge Lookout. The area here is spectacularly beautiful, possibly the most sublime place I've ever seen! 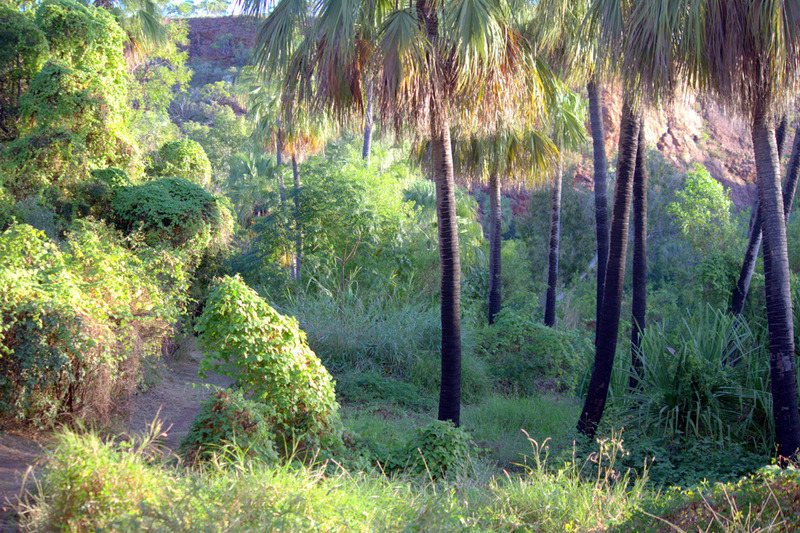 Along the creek we searched in the Pandanus and canegrass for Purple-crowned Fairy-wren (ssp macgillivrayi), where they were quite common - with a family every 100 m or so. At this time of year they were in non-breeding plumage. A unique species amongst fairy-wren, and birds generally: most species when they go into eclipse, non-breeding plumage, simply revert to a dull grey form of their original self. Purple-crowned Fairy-wren, by contrast, completely change into another bird, with plumage almost as interesting in eclipse as when they breed. Other birds along the creek included White-bellied Sea-Eagle, Azure Kingfisher, Blue-winged Kookaburra, Buff-sided Robin, Olive-backed Oriole, Paperbark Flycatcher, Northern Fantail and Crimson Finch. 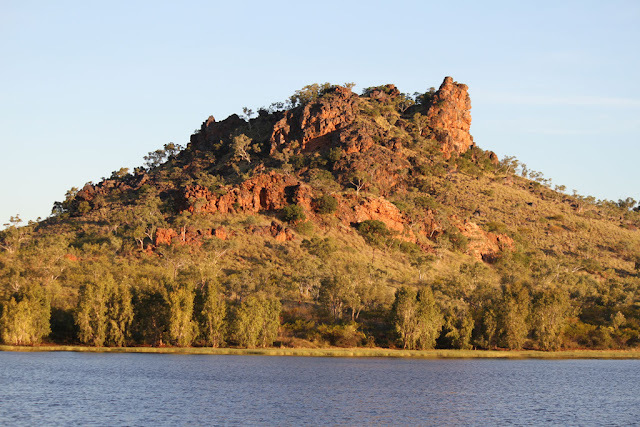 In the rocky escarpments at Lawn Hill - such as near the Duwadarri Lookout west of the campground, and the Island Stack - we found Sandstone Shrike-thrush and Little Woodswallow. Flowering plants were in abundance, most notably Grevillea dryandri and Holly-leaf Grevillea (Grevillea wickhamii). These attracted honeyeaters such as White-gaped, Yellow-tinted, Grey-headed, Grey-fronted, Brown, Black-chinned, White-throated, and Rufous-throated. Eagle-eyed Tim Bawden spotted a Grey Falcon (a resident species at Boodjamulla) flying down the valley near the Constance Ranges, just east of the campsite. By my humble opinion, the best way to see Grey Falcon at Lawn Hill is set yourself up at the Duwadarri Lookout and scan the sky around the campground and rangers' station, looking towards the Constance Ranges. 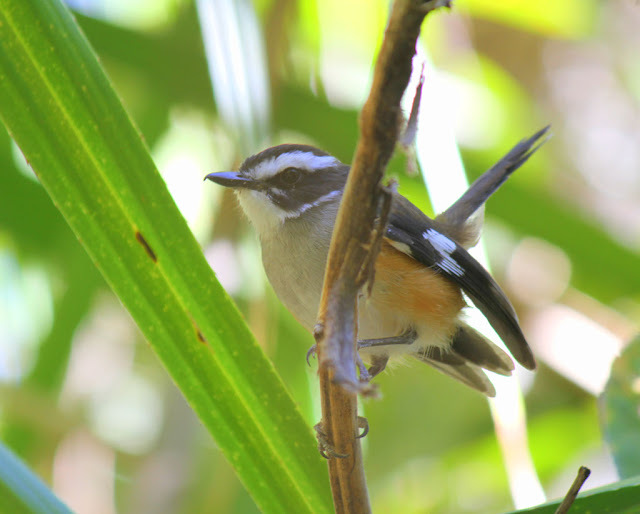 Other birds we saw at Lawn Hall included Little Friarbird, White-bellied Cuckoo-shrike, Variegated and Red-winged Fairy-wren and, at night, we heard Barking Owl and Southern Boobook. 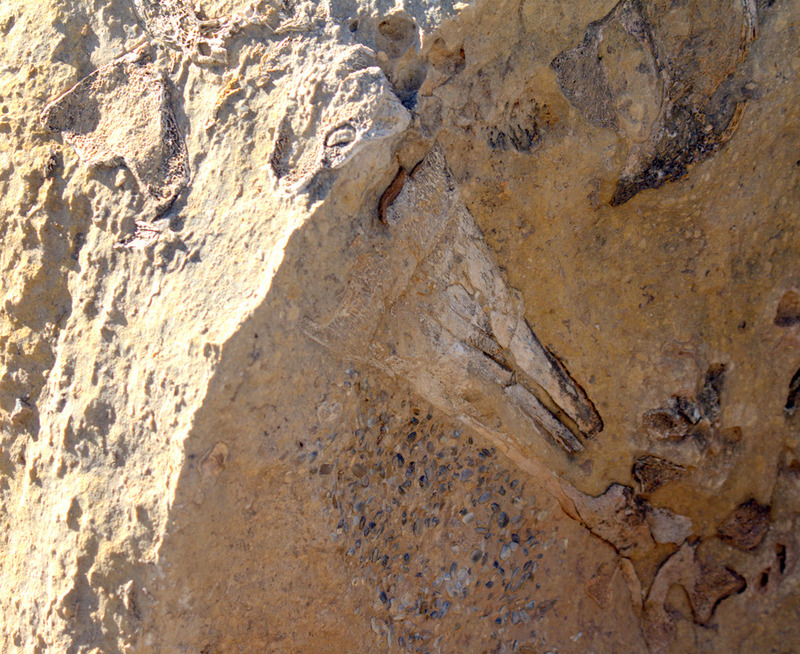 The Riversleigh fossil fields, located 4 km north of the Gregory River, was symbolically a very important place for me to visit. 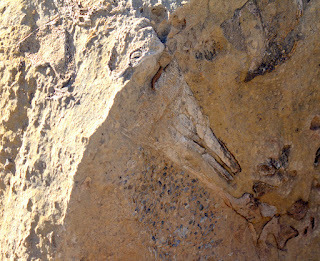 In 1992 my late father worked at the site, helping excavate fossils and working as the Team Doctor. 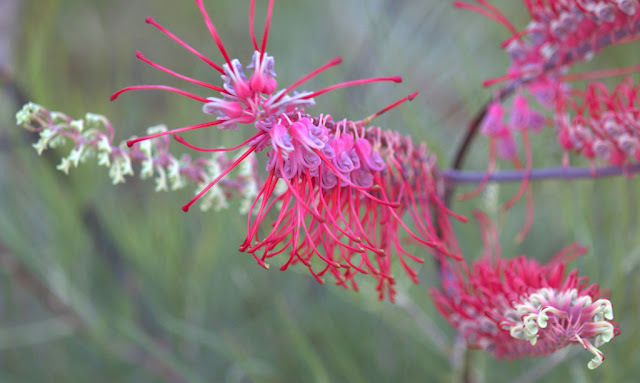 He talked many times about his trip to Riversleigh - as the birdwatcher in the group he would show the others in the group Purple-crowned Fairy-wren (then known more charmingly as Lilac-crowed Fairy-wren) feeding along Gregory River. 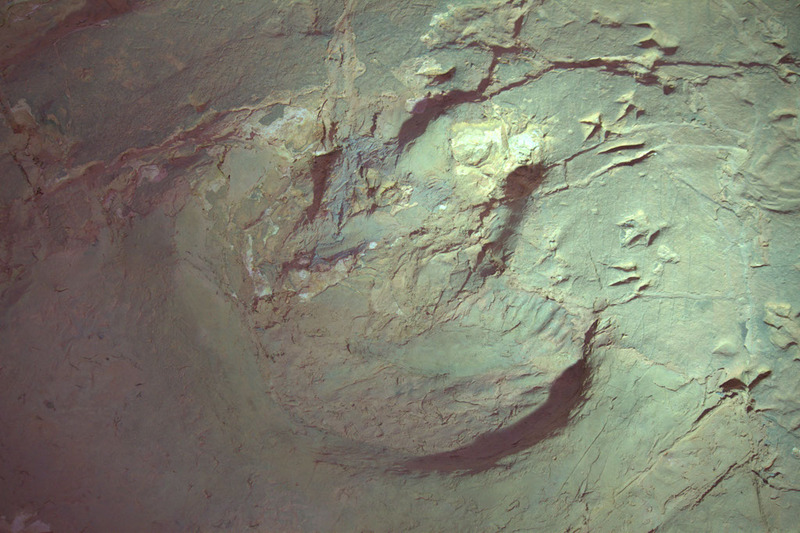 When travelling to Lawn Hil it's worth investigating the Riversleigh D deposits - they are one of the most important site for fossilised birds in the world, the best known being "Big Bird" (a Dromornithid species that looks like an enormous Emu). Spinifexbird and Spinifex Pigeon occur around fossil field. Our total bird tally for the trip was 168 species. We'd seen al our target species (Carpentarian and Kalkadoon Grasswren, Purple-crowed Fairy-wren, Buff-sided Robin and Pictorella Mannikin) plus a few bonus birds (Hall's Babbler, Chestnut-breasted Quail-thrush and Grey Falcon). We also saw some nice mammals (Purple-necked Rock-Wallaby) and reptiles (Black-headed Python, Ridge-tailed Monitor and Gilbert’s and Ring-tailed Dragon). Lake Moondarra is impressive. 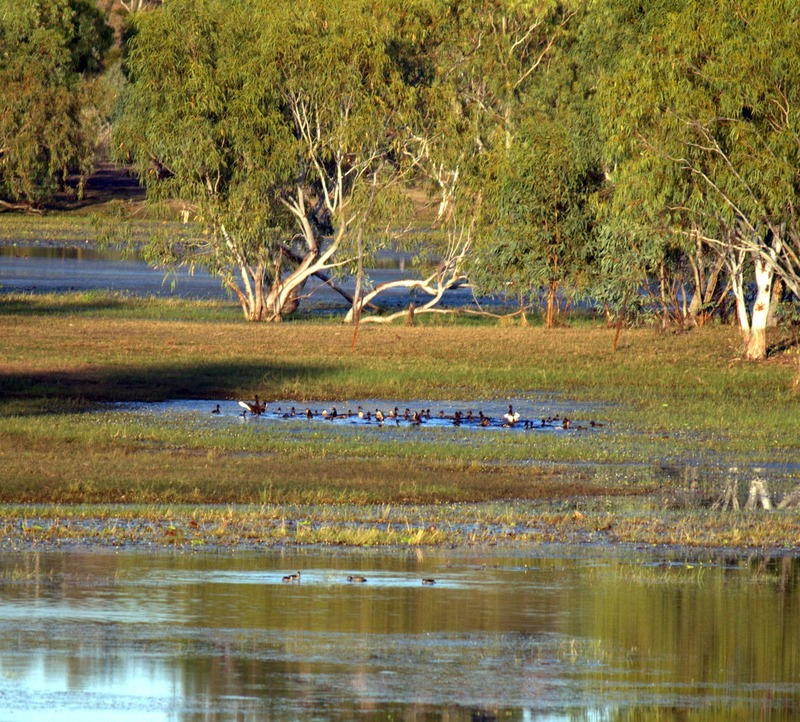 It must be one of the best inland lakes for birdwatching in Australia. I'd love to visit when the summer migrants arrive. Catching up with Carpentarian and Kalkadoon Grasswren meant that I've only two more of this iconic family of birds to go. Bladensburg is very pleasant, we all wanted to spend more time there - a great place to sit, relax and go birding for a couple of days. Finally it was emotionally significant for me to return to Riversleigh 20 years after my father had worked on the site. The binoculars I had with me were his, and they were the same pair he used when he visited 20 years earlier. They're a classic pair of 10x42 Zeiss: the words written on them read "Made in West Germany".